​NMIMS Distance Education MBA (PGDM) is one of the top ranked management courses in India. The distance education MBA programme has been ranked among the top 10 MBA courses by many top websites and every year thousands of students choose NMIMS to pursue their higher studies. NMIMS or Narsee Monjee Institute of Management Studies (NMIMS) has been the fastest growing institutes providing distance education in India. Presenting a blend of innovation, technology and a smart investments on technological propagations, NMIMS has a long history of academic excellence. Students who have NMIMS in their degree are often treated with utmost attention by recruiters and HRs of Multinational corporates. So if you are thinking to enhance the chances of acquiring a good job in management, then, here is one of the best options available for you, explained step by step. 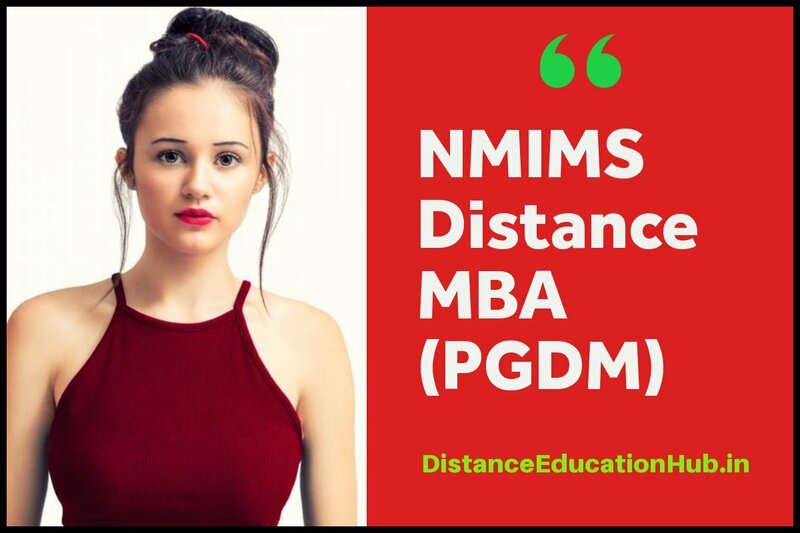 Here are some of the top benefits of NMIMS distance education MBA (PGDM). NMIMS has created a brand value for itself during the past decade a lot of which has been earned by only word of mouth. Earned Certifications: According to DNA, NMIMS has been ranked as 5th best institute in India that offers distance education in management studies. Apart from DNA, other premier accreditation has been awarded to NMIMS. Case Studies: Many management institutes rely on their theoretical models, but NMIMS is one of those institutes who believe in making students learn subjects the practical way. Case studies are provided by the dedicated faculty sporadically in order to encourage students the up and about of management i.e in real-time. Extra curricular activities: Distance education programs can be monotonous and follow a singular tone of teaching,but NMIMS has inculcated several other programs like group discussions, case study discussions and person-to-person doubt solving sessions as well. These extra-sessions are included in order to make sure that the students are motivated to continue the program with ease and perfection. Upgraded course curriculum: Plenty of distance education providers in India follow a one-time course curriculum which might not be updated on time, as it they are required, but the faculty of NMIMS-industry specialists ensure that the students are educated on the current industrial scenarios, which will help them become job-ready. NMIMS offers the following specializations with their distance education MBA (PGDM) programme. You can choose the one as per your interest. Students who have done graduation from recognized college or university and have secured an average percentage of 50% are eligible to apply for admission in NMIMS Distance MBA. There is no work-experience required as a mandate, but the faculty of NMIMS recommends the management courses curated and offered by NMIMS should be pursued by students with some experience to back them. The work experience will assist students to experience subject matter and apply in real-time basis further giving them an advantage to grow within the organization itself. Below is the admission procedure of distance education MBA course from NMIMS. Students are required to visit the institute's website and register themselves online. The application form would cost around somewhere 1200 INR. Spring batch- 19th September and 20th March and Fall batch- 21st March and 18th September. Dates are subject to institute’s discretion. Students can also visit the campus in Mumbai and get in touch with the faculty of the institute in order to gain better understanding of the management course they have decided to pursue. Admission counsellors are also allocated to specific students who are interests to know more about the course. Students can clear their doubts and take a decision afterwards. Students who have decided to take admission in the institute are required to submit the following documents and upload/send them to the required address. Enclose a photocopy of Birth Certificate. Enclose one photocopy each of 10, 10+2 and Graduation mark sheet. Proof of residence (one) photocopy required- This can be either of – Aadhar Card/Passport/PAN card/Electricity or Phone Bill/ Driving Licence or copy of any Bank account statement if none of the above are available. Demand Draft of the first fee in favor of ‘SVKM’s NMIMS’ payable at Mumbai. Enclose any work experience documents (if any). Please note that this is not included in the eligibility criteria. NMIMS Distance Education MBA Fee Structure is as follows. The total cost of the MBA distance education program in any field as offered by NMIMS is around 76,000/-. Students can pay this fee in full as well as in instalment as well. EMI Facility for 3, 6, 9, 12 months is also available but only in case of online payment at the use of credit cards offered by the following banks: HDFC, Axis, ICICI, Citi, HSBC, Standard Chartered, SBI, and, Kotak Mahindra Bank. Program fee per semester is 22,000 INR with 18% in GST. Examination fee of 600 INR per subject is applicable and a PCP (optional) is applicable at 250 INR per subject. All in all, NMIMS has acquired a good rating and is UGC-DEB certified institute, you can trust the university with your career.